Sometimes we have potential customers who come to us with a perception that our pools are too expensive compared to our competitors. With just a small amount of sharing we are able to explain the difference in our up front pricing vs. others who do not provide all the information. It is necessary to have a fence around a pool that meets local codes. You do have to have power run to the pumps that operate the filtration system. Gas lines have to be run if you want a heater on the pool/spa. We don’t leave these costs out to get the job and then bring them up when the project is underway and there is no going back. Please bring any competitors bid to us and we will be happy to compare on a line item basis our pool vs. theirs. You might be surprised at what you can get. One of the most common questions we get. It would be great if we had a quick reference for a budget, but it wouldn’t be fair to you for us to give a cookie cutter price quote without evaluating each job site independently. Factors such as access and storage space for staging construction materials should be considered during the bidding process. Please allow us to meet with you on site or at least with a survey of your backyard to provide an accurate estimate for you. What kind of pool should I build? We specialize in inground gunite pools. We also offer installation of Fiberglass pools as well. Every family is unique in what type of pool will fit their needs. We would love the opportunity to sit down with you and talk about what your wants and needs are for a pool, and then we can help guide you towards a pool that can accomodate you specifically. How will I know when it's time to replaster my pool? Plaster finishes for pools can vary in the length of their useful life. Proper chemical maintenance provides the best chance for a long life. When you are starting to see deep pitting and areas where the concrete shell of the pool is showing, it’s probably time to consider a renovation. Why should I take all the plaster off during a renovation vs. using a bonding agent? For the money that you spend on a replaster you want to get the most long lasting result. When using a bonding agent, the new plaster can only be as good as the surface it is attached to. We recommend taking the old plaster off down to the original gunite shell. You can save money up front using a bonding agent, but you run the risk of the old plaster losing its bond with the shell and then you have lost the new plaster on top of it as well. We can provide a renovation using either technique, but you need to be aware of the potential risk with leaving old plaster in place. 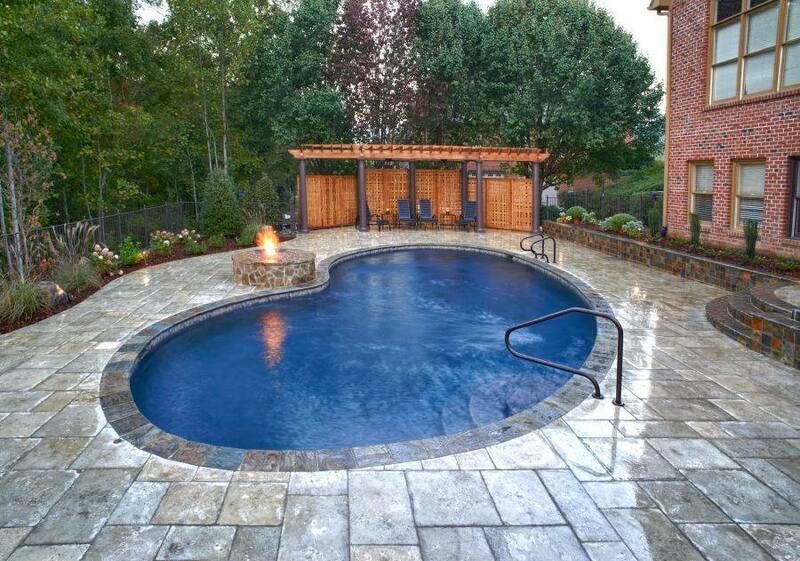 Interlocking concrete pavers, in our opinion, are the way to go around a swimming pool. If you ever have any kind of settlement issue, or plumbing repair, or even just a spill on the deck that stains, brick pavers can easily be removed and areas repaired or pavers replaced. Concrete decking has to be cut and poured back if it ever needs repair down the road. New concrete never matches old concrete when poured in place. There are all kinds of different price points for pavers. Most are a little more expensive than concrete, but worth it for serviceabilty and old world charm around a pool. Filter Backwash Procedure WARNING: To prevent equipment damage and possible injury, always turn off pump before changing valve positions. Ensure that the suction and backwash lines are open so that water is free to come from the pool and flow out the backwash line. Set control valve to backwash position. Stand clear of the filter and start the pump. Backwash filter for approximately 3 to 5 minutes or until backwash water is clean. Stop the pump and set valve to rinse position. Rinse filter for approximately 30 seconds. Stop the pump and set valve to filter position. Ensure that pool return line is open so that water may flow freely from the pool back to the pool. Open manual air bleeder on 6-Way Valve. Stand clear of filter and start the pump. Close manual air bleeder on the 6-Way Valve when all the air is removed and a steady stream of water emerges from the bleeder. The filter has now started its filtering cycle. You should ensure that water is returning to the pool and take note of the filter pressure. The filter pressure, in the above Step 12, should not exceed the pressure originally observed on the filter when it was initially started. If after backwashing, the pressure is 4 to 6 PSI above the start condition, it will be necessary to chemically clean the sand bed. Pool Care Basics, Where do I start? 5 Keys to Basic Pool Care The 5 essentials of pool maintenance described here will give you a basic understanding of how your pool functions. For a carefree swimming season, learn about the 5 keys and visit Shoemaker Pools any time you need assistance or expert advice. Pool care can be simple when you have a plan for routine maintenance and use the right products. KEEP IN MIND … Each pool maintenance key is very important. Consider each key as a simple, preventive maintenance step. The filter is one of your most important pieces of equipment. It removes both visible debris and most microscopic matter. Generally, a filter should be backwashed (the removal of material trapped on or in the filter media) when the water pressure in the filter reaches 8 to 10 psi above normal. (Check manufacturer’s guidelines and view the question about backwashing in our FAQ’s.) Because backwashing does not remove oils and deeply embedded debris, every filter needs to be chemically cleaned regularly. 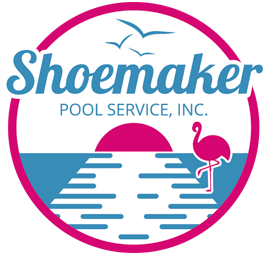 Shoemaker Pools can help you establish a filter maintenance program. Every pool has characteristics that must be regularly measured and adjusted. Most important are the pH and the level of active sanitizer. By testing these two factors at regular intervals, you’ll understand how bather load, weather and product application affect the water. Test your pool water two or three times per week. Also, take a sample to Shoemaker Pools when you open and close your pool, and every four to six weeks during the season. This will help you maintain proper water balance and greatly reduce the potential for problems. The last step in a total pool maintenance program is applying the right products to your pool water at the right time. This will help you: Provide a sanitary swimming environment. Balance the water to protect the equipment and pool surfaces. Unbalanced water can permanently damage both. Provide brilliant, sparkling water that’s inviting.